What Soccer/Football club(s) do you follow? This is open to any Soccer/ Football club anywhere in the world. Sorry, this is limited to Soccer, which is called Football everywhere else except North America. I currently follow the Orlando City Soccer Club which is only three years old and a member of the USL Pro league. We're the reigning league champions and have our eyes dead set at getting a Major League Soccer (MLS) invite. We've already beaten several MLS teams including Colorado and Sporting Kansas City and, we even beat Newcastle from the EPL 1-0 two years ago. We just lost to Fluminense, the current Brazilian Champions, 4-3 in a freindly match and we've advanced to the Quarterfinals to play the Chicago Fire from the MLS. We'll play host to the next game and will play the winner of the DC United/New England Revolution game which are both MLS teams. Re: What Soccer/Football club(s) do you follow? Well it looks like you and I are the only Soccer fans here. I was hoping to get a few more responses on this one. It looks like the Whitecaps aren't doing too bad this year so far. I must admit that I really haven't been paying much attention to MLS until this year as the Orlando City Lions are hoping to get a MLS invite soon. I watch whatever is on the TV, but really only follow the national teams. I'm not sure MLS can expand, and think other clubs could join if able. MLS doesn't seem rich enough to hire high dollar players to keep MLS elite. Right now, Soccer is still a very young professional sport in North America when compared to the NFL, MLB, NASCAR, Indy Car, NBA, and NHL. Soccer has come a long way in recent years but it still has a long way to go. Keep in mind that Boxing was a very popular sport in the US for a long time, then came Major League Baseball which was popular for a very long time until the 1960's and 70's when the NFL rose to popularity. The MLS knows it's limitations which is why one of it's requirements for a MLS franchise is that each team has or is in the process of building a Soccer specific stadium with a maximum capacity of about 20,000 seats. They learned that filling a 20,000 seat stadium %75 full looks better than having 10-15,000 fans show up at a 70-80,000 seat stadium. They've also expressed a desire to expand back into the Southeastern US as they did have a team in Miami called the Fusion many years ago. That team either folded or moved as that was during the MLS's first couple of years when they were allowing teams to play in 70-80,000 seat NFL stadiums. There's speculation that it's been narrowed down to at least three possible sites, Atlanta, Orlando, and Miami for one or two more teams. So far it's looking like Orlando and Atlanta. I don't think Miami will get another team due to the extreme lack of support for the Fusion and the fact that two of the three established teams are having a hard time drawing a good attendance for the last couple of seasons. I personally think Soccer is slowly gaining a foothold but it'll take time to gain popularity, maybe not the top sport as it is in Europe, but I think it'll get there eventually. I just hope Orlando gets a MLS franchise and hangs on to it so we can have another professional sports team other than the lackluster Magic of the NBA and the Predators of the AFL (Arena Football League). Orlando City Lions are going to make their pitch for financing the new multi use Soccer stadium infront of the Orange County Commission on August 6th. If all goes well, they'll give us the financing needed and we can make our pitch to be the next MLS expansion team. On another note, the Lions will be playing the Seattle Sounders from the MLS on August 11 in Orlando. GO CITY! Orlando City just beat the Charleston Battery 3-2 to advance to the USLPro title match. Just to keep you updated for those of us who are interested in possibly MLS's next expansion team. 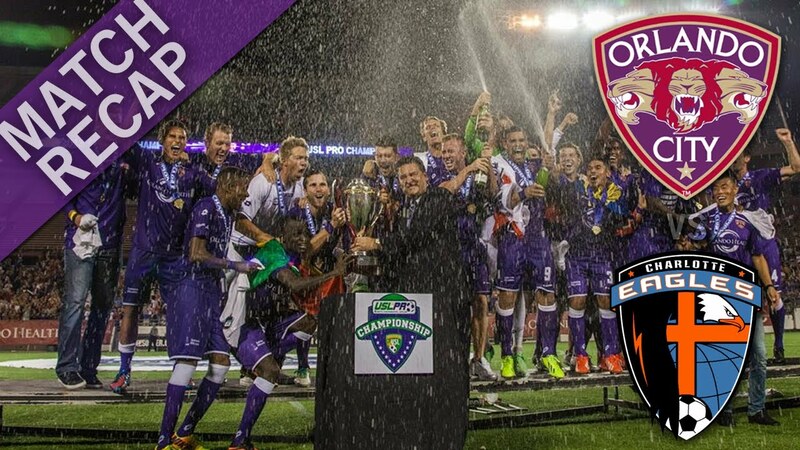 The Orlando City Lions will be hosting the USL Pro Title match and will be playing Charlotte at the Citrus Bowl this Saturday night at 7:30 pm. Tickets start at $15 and can be bought at the gate. Here's a match recap video of Orlando's 3-2 victory over the Charleston Battery last Friday night. Well the Orlando City Lions are now two time USL Pro Champions by defeating the Charlotte Eagles 7-4 in front of a record crowd of 20,886 fans at the Florida Citrus Bowl. Lions President Phil Rawlins said the attendance was better than seven out of ten MLS games being played that day. I tuned in via YouTube at about the sixtieth minute and the Eagles had just gone up 3-2. Then in the final thirty minutes, Orlando City went on a 4-1 blitz to win the title. Dom Dwyer, on loan from Sporting KC and the leading scorer in USL Pro this year and only playing in 13 games this season, came back for the title game to score four goals himself. Watch out MLS, Dom is quite a soccer player. Well here's the match recap of the USL Pro title game. Dom, you're a legend in Orlando and I wish you the very best at Sporting KC, except when you play against Orlando in the future. Last edited by Coasterjunkie; 09-11-2013, 04:06 PM. It's official! Orlando City Soccer now has the funds to build a 18,000 open air soccer specific stadium with covering for the spectators. It passed the last hurdle, a 5-2 vote in favor by the Orange County Comission tonight. The Orlando City Lions are well on our way to becoming the 21st MLS franchise. MLS has already stated that Orlando would get the franchise if we got our stadium funding in line and we just did. We are FC Barca fans.